This SITREX mowers range, including 4 - 5 - 6 - 7 - discs machines, fits the requirements of small and large farms. 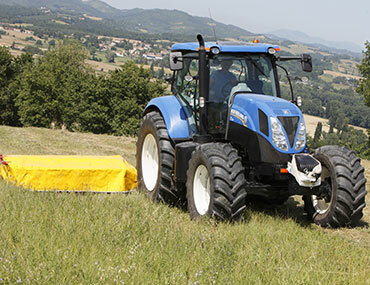 The DM4 Disc mower, with 4 discs and 1.67m / 65" 3/4 working width is especially suitable for small farms. The DM5 Disc mower, with 5 discs and 2.05 m / 80" 3/4 working width has the peculiarity of two inner discs which turn to the same direction. 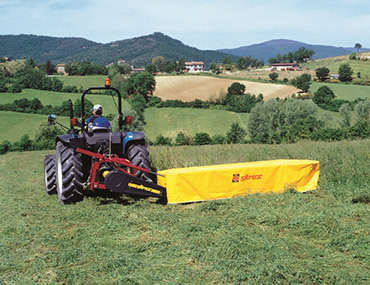 This allows to obtain a narrower windrow which avoids the tractor running over the mowed grass. This mower fits the requirements of a medium-sized farm. The DM6 Disc mower, with 6 discs and 2.40m / 94" 1/2 working width is suitable for medium-sized and large farms. The DM7 Disc mower, with 7 discs and 2.80 m /110" 1/4 is especially suitable for large farms. High definitions pinions, bearings, discs and knives, guarantee the best reliability even under heavy working conditions. The peculiar disc oval shape guarantees a series of advantages comparing to the round shaped discs : better unloading of forage; excellent overlapping of the knives fixed on the larger disc axle; clean and regular cut. Moreover, a warped knife cannot touch the adjoining disc and there is actually no risk of foreign body getting in between two discs and clogging the machine. The knives are made of high quality steel and severely tested. The peculiar helicoidal shape of the knife guarantees a perfect cut. The mowing unit articulated joint is conceived to obtain the best adaptation to the ground contour. Cuts along edges and slopes are thus obtained without problems. In case of obstacles there is a mechanism which pulls back the mowing unit so that the blow is immediately warded off. The mechanism resetting is obtained through the reverse movement. Adjustment spring: this spring allows the mowing unit pressure adjustment on the ground, following the ground consistence. Detail of the peculiar oval disc shape and of the helicoidal section knives. Cutting Width 2,45 mt - 96"
Cutting Width 2,85 mt - 112"
Cutting Width 3,23 mt - 127"